So much for Trump consistency in ending foreign military engagements. 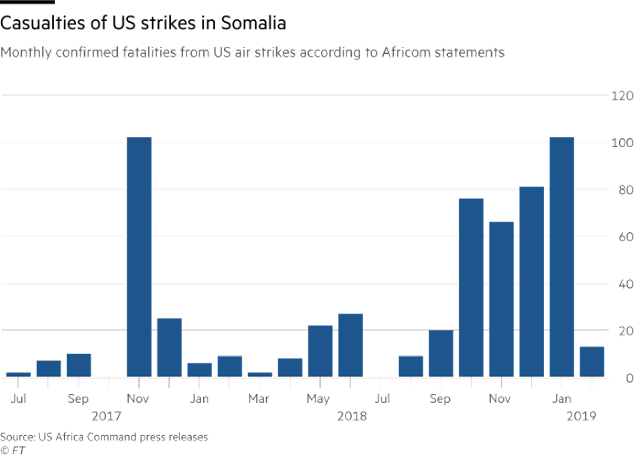 US air strikes killed more than 100 militants in Somalia in January — one of the deadliest months since the US began its offensive in the country against al-Shabaab, reports The Financial Times. The casualties reflect a dramatic escalation in the use air strikes against the Somali extremist group since President Trump took office. The air offensive is part of one of Washington’s most active — and least discussed — military campaigns anywhere in the world... 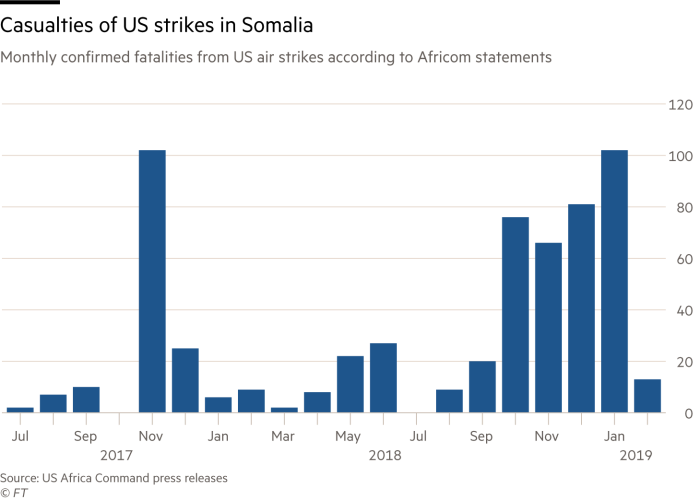 The surge in US air attacks, which are in support of the Somali national army, is the result of a 2017 policy change by the Trump administration that gave the Department of Defence greater latitude to authorise strikes. Previously, under guidelines established by President Barack Obama, air strikes outside of active US conflict zones needed to be vetted by multiple agencies and could only be approved if the target posed a “continuing, imminent threat” to the US. The shift has taken an unprecedented toll on al-Shabaab’s rank and file, leaving more than 500 fighters dead in the past two years. The U.S. Government impulsively and blithely collects foreign entanglements the way a woman collects new pairs of shoes. "US air strikes killed more than 100 militants in Somalia in January..."
I was curious about this term "militant" that all of the press uses when it parrots the US government (by the way, note how the piece say "US air strikes" as opposed to "US government air strikes," as if the citizenry and the government are one and the same). 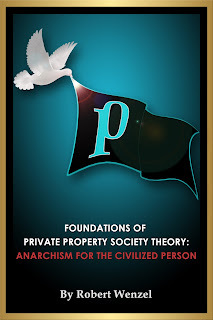 The definition I found is "combative and aggressive in support of a political or social cause, and typically favoring extreme, violent, or confrontational methods." So, two questions. First, how does the US government know that each person it killed fits this definition? 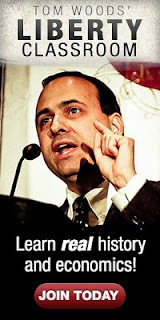 Did it hold local trials and adduce the appropriate evidence? Second, since the stated role of the US military is to "Keep America safe," during these trials, was there clear evidence that the militants were directing their violence against any part of the 50 states? To ask these questions is to answer them. Sadly, they are never asked. 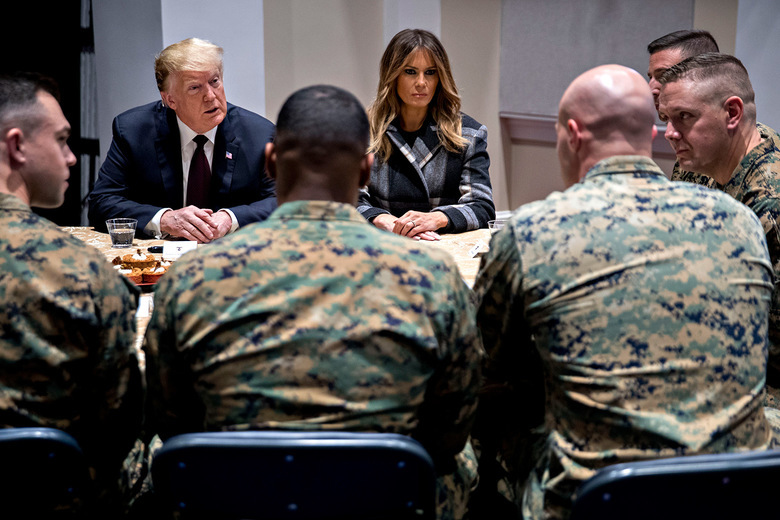 Does Trump even have control of the military any more?